twbs/bootstrap-sass: Official Sass port of Bootstrap 2 and 3.
plataformatec/devise: Flexible authentication solution for Rails with Warden. CanCanCommunity/cancancan: Continuation of CanCan, the authorization Gem for Ruby on Rails. bkeepers/dotenv: Loads environment variables from .env. pry-byebug を使ってRailsアプリをステップ実行する - Hack Your Design! bbatsov/rubocop: A Ruby static code analyzer, based on the community Ruby style guide. onk/onkcop: OnkCop is a RuboCop configration gem. 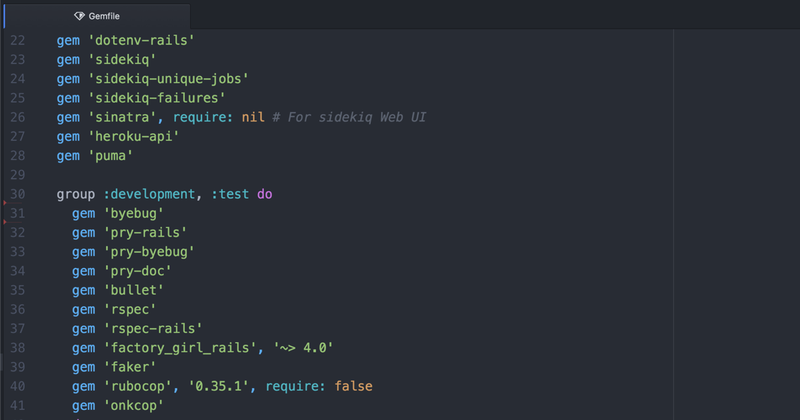 rails/web-console: Rails Console on the Browser. ryanb/letter_opener: Preview mail in the browser instead of sending. guard/listen: The Listen gem listens to file modifications and notifies you about the changes. travisjeffery/timecop: A gem providing "time travel", "time freezing", and "time acceleration" capabilities, making it simple to test time-dependent code. It provides a unified method to mock Time.now, Date.today, and DateTime.now in a single call.